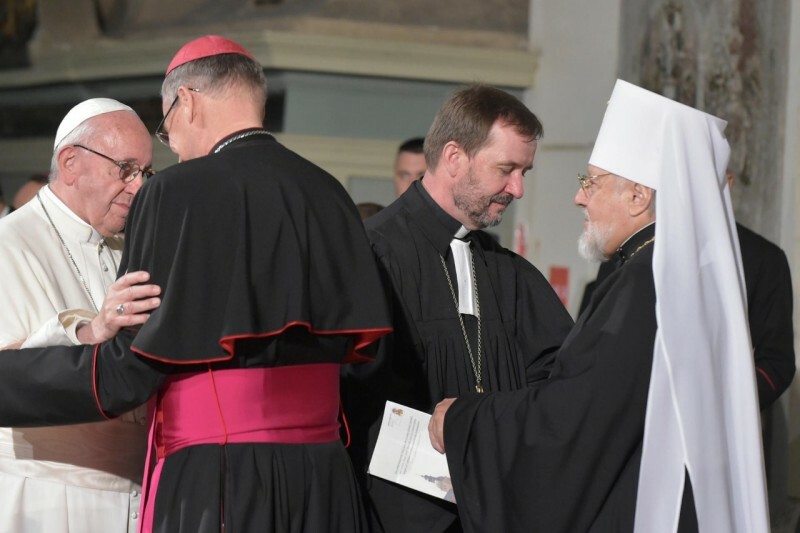 Pope Francis spoke September 24, 2018, during Ecumenical Prayer in Lutheran Cathedral of Santa Maria, Riga, part of his apostolic journey to Lithuania, Latvia, and Estonia. Following is the Vatican-provided text of his address at the event. It is a great pleasure for me to meet with you in this land marked by a journey of recognition, cooperation, and friendship between the different Christian churches, which have succeeded in building unity while preserving the unique and rich identity of each. I might say that this is a “lived ecumenism” that is one of Latvia’s special traits. Without a doubt, it is a reason for hope and thanksgiving. I thank Archbishop Jānis Vanags for having opened his doors to us for this prayer meeting. For over eight hundred years, this cathedral has been home to the Christian life of this city, a faithful witness to all those brothers and sisters of ours who have come here to worship and pray, to sustain their hope in moments of trial and to find the courage to face times of great injustice and suffering. Today it welcomes us so that the Holy Spirit can continue to weave bonds of communion between us and so make us weavers of unity in our cities, lest our differences turn into divisions. May the Holy Spirit arm us with the weapons of dialogue, understanding, and desire for mutual recognition and fraternity (cf. Eph 6:13-18). For those who live here, it is more than a monumental organ; it is part of the life, traditions, and identity of this place. For tourists, though, it is a work of art to look at and to photograph. This is a recurring danger for all of us: from “residents” we can become “tourists”. We can take what gives us our very identity and turn it into a curio from the past, a tourist attraction, a museum piece that recalls the achievements of earlier ages, an object of great historical value, but no longer one capable of thrilling the hearts of those who encounter it. If the music of the Gospel is no longer heard in our lives or becomes a mere period piece, it will no longer be capable of breaking through the monotony that stifles hope and makes all our activity fruitless. “Father, that all may be one… so that the world may believe” (Jn 17:21). These words, thank God, continue to echo in our midst. They are those of Jesus praying to the Father before his passion. As he looked ahead to his own cross, and the crosses of so many of our brothers and sisters, Jesus continued to pray to the Father. This constant and quiet prayer marks out a path for us; it shows us the way to follow. Immersed in this prayer, as believers in him and in his Church, we desire the communion of grace that corresponds to the Father’s plan from all eternity (cf. SAINT JOHN PAUL II, Encyclical Ut Unum Sint, 9). And we discover there the only path possible for all ecumenism: that of confronting the cross of suffering experienced by so many young people, elderly persons and young children all too often exploited, lacking meaning in life, deprived of opportunities and suffering from loneliness. Jesus turning to his Father, and to us, his brothers and sisters continues to pray: “that all may be one”.